In expectation of an imminent US-led offensive to take Raqqa, the Islamic State in the second half of March began dismantling parts of its Syrian headquarters and lifting some of its senior commanders to new locations for new and expanded terrorist operations. DEBKA Weekly’s intelligence and counterterrorism sources disclose the three new destinations: they are the Euphrates Valley which straddles the Syrian-Iraqi border, Anbar Province in western Iraq near the Jordanian border and Egyptian Sinai. 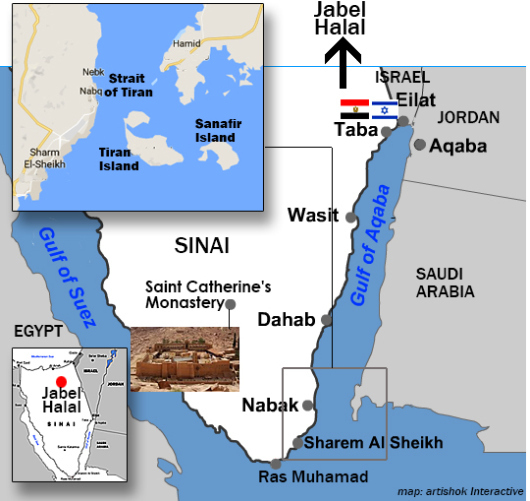 The ISIS commanders assigned to Sinai took over the existing stronghold in the forbidding Jabal (Mount) Halal running down the center of the peninsula, which has been dubbed the Tora Bora of Sinai (see attached map), by virtue of the interconnected tunnel networks riddling the range. Its topography resembles the ISIS cave complex destroyed in Afghanistan on April 13 by an American GBU-43/B bomb. The Egyptian army has been thrown back in one attempt after another to scale this ISIS bastion and liquidate its Sinai headquarters. Egyptian President Abdul-Fatteh El-Sisi reported on the latest attempt when he met US President Donald Trump at the White House on April 3. Two days earlier, Egyptian troops managed to kill 31 terrorists and destroy a few caves containing weapons and ammunition, but the entire complex remained intact. El-Sisi broached the possibility of a US missile attack to get the job done. A decision about a possible Tomahawk cruise missile attack on Jabal Halal, like the US strike on the Syrian Shayrat air base on April 7 was due to be made during US Defense Secretary James Mattis’ visit to Cairo on Wednesday April 19. Our intelligence sources have discovered that the ISIS commanders who migrated from Raqqa have substantially restructured the organization’s Sinai operation by reshuffling the Bedouin components of the various terrorist strike teams. Until now, the Bedouin enlisted to each of those teams were drawn from the same tribe. The Sinai Bedouin population numbers around 10 main tribes, each consisting of several family groups. An average tribe has between 70,000 and 100,000 members, as well as kinship ties with branches or families in Egypt, Israel and Jordan. The new commanders have now ordained that each team of terrorists be drawn from different tribes. Young Bedouin recruits are therefore forced to accept for the first time fellow combatants from tribes other than their own, even though this means defying their tribal elders. Under the former leadership of the now displaced local ISIS affiliate, Ansar Bayt-Maqdis, the tribes of northern and western Sinai carried the brunt of terrorist attacks, operating on their own turf. By mixing up the tribal teams, the newly-arrived ISIS commanders have opened the door to fresh fighting talent from the Bedouin of the South. This radical departure from the conventional mode of Sinai terror fits the Islamic State’s plans to expand its campaign of terror to new fields, transposing it from northern Sinai to the south – and from there to the western coast of the Gulf of Aqaba. In their sights now are the famous holiday and deep sea diving resorts of the region. Those targets are located along a 220km-long strip of coastline from the Israeli port of Eilat in the north to Ras Muhamad at the southern tip of the Sinai Peninsula, marking the junction of the Red Sea, the Gulf of Suez and the Gulf of Aqaba. Situated along this strip are the Egyptian resort of Sharm el-Sheikh and a chain of holiday camps. Jordan’s only seaport and seaside resort of Aqaba also finds itself in danger of this expanded terrorist menace. To meet the approaching hazard, Israel last week shut down the Taba crossing into Egyptian Sinai and prohibited its citizens from making for their favorite holiday villages on the Gulf of Aqaba. Israel and Egypt have built up their military presence in the region. According to our sources, the attack by Islamic State gunmen Wednesday, April 19, on a check post guarding the ancient Saint Catherine’s Monastery, at the foot of Mount Moses in southern Sinai, was the first operation to be conducted by the new Islamist terror regime which has taken up quarters in the peninsula. The assailants killed an Egyptian police officer and injured four others, but were repulsed before they could storm the monastery as they planned.